MISSOULA — Neither rain nor snow nor blustery wind could block Mariah Harvey and her Montana track and field teammates from practicing outside the past few weeks. Harvey showed Friday that her hard work in trying weather is paying off. 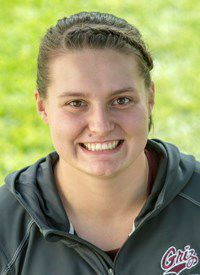 The junior finished with the top mark among American competitors in the women's hammer throw at the Montana Open at Dornblaser Field. "This is the best day by far this outdoor season and I might even get a suntan," joked the Manhattan product, who posted a throw of 165 feet, 2 inches. "Not since high school do I remember a spring like this. I'm used to the Montana weather for sure but this is one of the top ones for me weather wise." Harvey was one of a handful of Grizzlies competing in the women's hammer. The list did not include Missoula's own Hana Feilzer, who is in Los Angeles along with a group of select Montana athletes participating in Saturday's Rafter Johnson/Jackie Joyner-Kersee Invitational. The only woman to finish with a better mark than Harvey in Friday's competition was visiting from Lethbridge, Alberta, Canada. Harvey called her effort "a good start." "I've got a lot of work to put in," she said with a smile. "But it was my best so far this year." Harvey says the hammer throw is harder than it looks. There's more to it than simply swinging and winging it. "It's so much different," she related. "You don't get to do it until college, so you come in and you're brand new to the sport and it's very technical. "It's like putting puzzle pieces together, trying to figure out what's going to work and what's not going to work. A good challenge." Harvey will also compete in Saturday's portion of the Montana Open in the shot put and discus. She and all her teammates are hoping to cash in on the added excitement surrounding Grizzly track and field this spring. In 25 days Montana will host the Big Sky Conference meet. "It's huge for us," she offered. "Being from Montana and having the opportunity to throw in front of a lot of people you know on your home track is awesome. "You can feel there's more energy to push for that meet." The rest of the field events in the Montana Open will be held Saturday at Dornblaser Field, starting with the men's long jump and women's shot put and long jump at 10:15 a.m. The running events will start at 11:15 a.m., with the women's steeplechase up first. Saturday will be the last day to watch the Grizzly men's and women's track team at home before the Big Sky meet.